In boiler two kinds of drafts are predominant – forced draft and induced draft. Each requires set of fans that can perform its function. Draft fans are classified as centrifugal and axial type based on the direction of the air flow in the boiler. Different industries use different type of fans depending upon their industrial needs. In this type of fans air flow is along the radial direction of the fan. Centrifugal fans use a rotating impeller to move air initially, radially outwards and then tangentially away from the tip of the blades. They can generate high pressures. They are used in dirt removal of the air streams, in material handling applications and systems operating at high temperatures. Initially the incoming air moves parallel to the hub and turns radially outwards the perimeter of impeller and blade tips. The air gains kinetic energy while moving from impeller hub to the blade tips. Then the kinetic energy is converted to pressure energy as air enters the tangential discharge path. In this type the blades are inclined away from the direction of rotation. They are more efficient than the flat blades. Low angel of contact with the airstream promotes the accumulation of deposits on the fan blades. Suitable for forced draft system. This kind is often selected because of its non-overloading motor characteristic. The airfoil blades tilt away from the direction of rotation of the fan. They are most efficient but most unstable because of the stall. Performance drops off at high airflow rates. Suitable for forced draft system. This type of fans are capable of handling high-particulate air streams, including dust, wood, chips and metal pieces because its flat blade shape limits the material build up. When the system is at halt where vibrations are produced, the blades allow this fan to operate safely and quietly. In axial fans the air flow direction is parallel to the impeller shaft. The parts of the axial fan are propeller and vanes. Axial fans usually have a series of vanes coupled on the propeller shaft. They develop high airflow rates and low pressures. They are not suitable for the extensive duct work. They have less efficiency and are inexpensive. Often used in ventilation systems. They achieve higher efficiency than propeller fans. They are used in medium pressure systems. It has high operating speeds and generates moderate airflow noise. As these fans have rotation mass, they attain high speed in less time. It is similar to the tube axial fan with outlet vanes to straighten the air flow. The air flow profile is similar. These type of fans are used in induced draft type system. 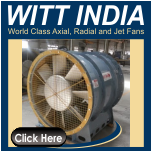 The kind of blades in axial fans are small and have light weight and low cost. Used in synchronous speed of the induction motor. Belt drive units offer wide range of speed selection. When compared the airflow axial fan must rotate at higher speed than the centrifugal fan. There are some other kinds of fan designs too that can be used in draft of the system. 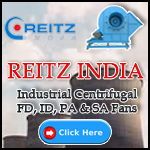 Some are given as centrifugal inline fans, centrifugal roof exhaust fans, utility fans etc.